Rumicare has been developed to help counteract rumen and intestinal acidity and to promote adequate rumen protozoa populations in intensively fed animals and those consuming low fibre diets such as spring grass. Rumicare is formulated using a unique combination of phased release rumen buffering minerals. Available as Rumicare Beef and Rumicare Dairy. Added Rumigest® yeast will enhance rumen bacteria populations and activity aiding better digestion of starch and cellulose. 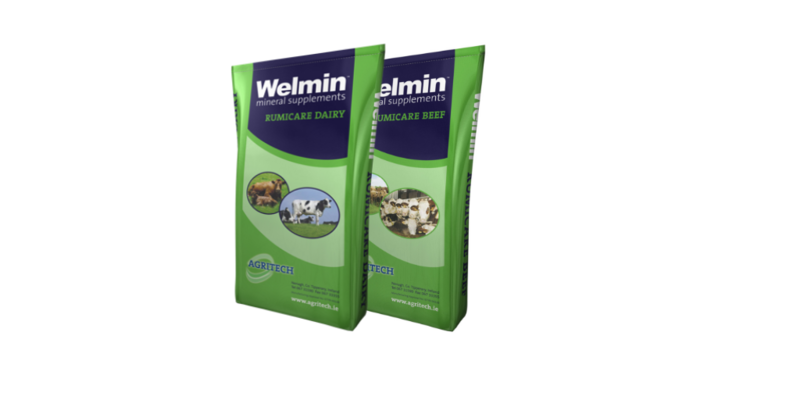 Welmin Rumicare supplies calcium, magnesium and sodium each of which are very beneficial to the animal, particularly the high yielding early lactating dairy cow. Lowers requirement for straw leaving more room for quality feed. Reduced indigestion, lameness and stress. Improved feed efficiency. Higher output per animal. Smoother transition diets with less setbacks including less displaced abomasums. Phased release technology ensures constant and ongoing fight against SARA and clinical acidosis. The tell-tale signs of SARA are sometimes difficult to detect through visual observation. Cows swishing their tails (due to passing acidic manure). Animals performing 5-10% below capacity.